AP Police (SI & ASI)Recruitment Notification 2016: Andhra Pradesh state level police recruitment board released a notification regarding its 2016 recruitment for sub-inspector & Assistant Sub-Inspector posts on 24th August 2016. This notification of AP Police is for Stipendiary Cadet Trainee SI & ASI Posts. 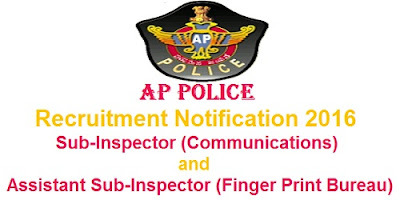 This 2016 SI & ASI recruitment notification of AP Police is for 28 vacancies in Communications & finger print Bureau wings. AP State Level Police Recruitment Board invites all the Indian Men & women to apply for this recruitment through online. The online applications for this SI & ASI recruitment of AP Police are opened from 1st September 2016 in the official website of AP Police Recruitment board http://recruitment.appolice.gov.in. All interested candidates can check the entire details of the notification before going to apply, it’s just to get clarity about the basic requirements for SI & ASI posts. The candidates who are eligible for this recruitment of AP Police can apply for it through online on or before 25th September 2016. The Brief details of the AP Police Sub-Inspector and Assistant Sub-Inspector Recruitment 2016 are given as below. Eligibility Criteria: The candidate’s minimum eligibility criteria to apply for this recruitment are as follows. Eligibility criteria in the sense of educational qualifications, Age boundaries and basic physical standards, the candidate fulfill the required eligibility criteria to apply for this recruitment of AP Police. Age Limits: The age is considered as on 1st July 2016 and upper age relaxation is applicable as per government rules. - Diploma/B.Tech in Electronics & Communication/Electrical & Electronics/Computer Science/Information Technology. - Special Diploma course in Electronics with specialization in Computer Engineering. - Special Diploma Course in Electronics with specialization in Communication Engineering Awarded by any State Board of Technical Education and Training. - A qualification approved by the Government of Andhra Pradesh as equivalent to any of the above. - Degree with Computer Science/Computer Application/Information Technology as one of the subjects from any recognized university/Instistute in India. Height: Must not be less than 162 centimeters. i) Eye Sight: Each eye must have a full field of vision. ii) The candidate should possess sound health and be free from any bodily defect or infirmity which will render him unfit for police service. iii) Physically Handicapped/ Knocking-knees, Pigeon chest, flat foot, Vericose veins, Hammer Toes, fractured limbs, decayed teeth, Stammering, hard of hearing and abnormal psychological behavior candidates will not be consider for recruitment. 1. Visit any of Mee Seva (e-Seva)/AP Online/TS Online Centers. 2. Pay the Application Fee by providing the Basic details like Name, Father’s Name, Date of Birth, Mobile Number, Community and SSC Hall Ticket Number or its equivalent. 3. Pay the Fee amount by quoting the Notification number Rc. No. 244/R&T/Rect.1/2016 in favor of Chairman, State Level Police Recruitment Board, Andhra Pradesh. 4. After Payment they will give the Fee Receipt. 1. Firstly Pay the Application Fee at any center of Mee Seva (e-Seva)/AP Online/TS Online. 2. After getting the fee Receipt, The candidate needs to visit the AP Police Recruitment Board website http://recruitment.appolice.gov.in. 3. In that select SI (Communications) & ASI (Finger Print Bureau) Link given under Latest Jobs. 4. Select the Submit Application link related to SI (Communications) & ASI (Finger Print Bureau). 5. Online Application Form window will be opened, Fill the form carefully. 6. After Successful submission of online application, Download the application/take a print of the application. Selection Procedure: this recruitment selection will be of 3 phases, the candidates who are registered for this recruitment will be invited for the first phase and who qualified in 1st phase will be invited for 2nd phase PET this is only qualifying nature. The candidate who qualified in 1st & 2nd phase will be invited for final phase that is written examination. The final selection is based on the written exam (Paper-II & Paper-III) score (merit based). Note: Paper-I is only qualifying nature and the written exam minimum qualified marks for OC is 40%, BC is 35% and for SC/ST/Ex-Servicemen is 30%. Last date for online applications is 25th September 2016. PMT & PET will be started from 13th October 2016 at 6th Battalion APSP Mangalagiri near Vijayawada. PMT & PET will be held on 17th October 2016 for Women candidates at 6th Battalion APSP Mangalagiri near Vijayawada. Last date for PM/PET tests is 27th October 2016. Download Call Letters for PMT & PET From 27th September 2016. Written Exam will be held on 19th November 2016 (first 2 papers) and 20th November 2016 (Technical paper in morning & Afternoon shifts). Click on any of the below 3 Links: to check your result status of SI (Communications) & ASI (FPB) PM/PET Events and certificate verification which was held on 13th to 27th October 2016 at 6th Battalion, APSP, Mangalagiri, Vijayawada. sir i am Btech graduate with ECE branch, can i apply for ASI fingerprint bureauu?? if you have computer science/computer application/information technology as one of the subjects in your graduation then only you can apply for ASI fingerprint bureau post. sir,i am a computer science student and interested in ASI finger print bureau post. can you please tell me how many available post are there in this year..? 27th oct is the day to attend pet/pm test who missed their pet/pm test. you can attend on 27th oct. test starts from 5am. sp told to everyone like that when i attend to test i heard the announcement. every one in the battalium is very friendly go and attend don't miss.. its cool and process is very fast within 2 hours your test will be completed. I am joined b.tech .my principal was not return to the certificate.i can attend xerox copy certificates. yes, if you are passed the PMT/PET then you can attend the written exam. But original certificates are very important. Certificate verification must be conducted even after written exam or before final merit list preparation for appointment. Original Certificates of your mentioned qualification are very important in any recruitment process. Ask/Request your college principal one more time to get your original certificates to attend the recruitment process. They have given us bonified like document that our certificates are in college, is this required for recruitment process? Can anyone tell me wat is the last date for certificates verification. sir can u plz let me knw wat books should i prefer for communication exams...i did my graduation in ece branch. Sir due to some health problem I am not attend the test till the last date. Is there any chance to attend the pet test in this month end. Pls give me any suggestion sir. I am perfectly prepared for PET test and written test..
there is no chance for PM/PET schedule extension. let me knw the books i should go through for written exam .i had applied for s.i communications..i did my graduation in ece branch..
for reasoning & Quantitative Aptitude R.S.Aggarwal (author) Books are the best for practice. For technical paper any book which has the basic details of the required syllabus, you have to decide that after checking 2 or 3 books in the market. thank u ,sir when will the written exam be conducted for s.i communication post. Can you let me know when the written test going to happen(date). I qualified both communication and finger print..only one exam conducted for both posts ? My be you are rejected Because of your absence in Certificate verification process. Certificate verification is very important especially in Police department. Hi sir I need the model paper uploaded in site.but it is not available in website right now.so I need model paper of English descriptive.will u pls send me to my mail.mail id.-p.farook597@gmail.com. .if any one have model paper u guys pls send me to my mail. sir is there any negative marking for s.i communication exam? ?any idea about the marks to get this job that is out of 300..this information will be a fetching point . thank you sir for the information..
sir,i had question...when will the results be declared?? Final selection list is prepared based on Candidate's Merit marks (category wide Top scorers) of FWT Paper-II,III & IV. there is no special cut off for it. I am qualified in paper 1 2 and 3 then what is the next procedure....for medical tests. final short listed/selected candidates will be called for Original Certificate Verification, Character & Antecedents Verification and after that Medical Examination will be conducted for the candidates who qualified in these. i am qualified in 3 papers and i got 55+86=144 in si communication.i am from bc-a is there any chance for have name in merit list? Sir I am not selected in paper 1. But I got 35.5+109=145.5 in 2nd and 3rd papers. I am belongs to SC category. Shall I go for challenge verification in 1st paper? Is there any chance to get the job with this score? why the no of persons failed in paper-1. anybody have idea ? sir i got 120 marks in s.i communication ..there are 26 female candidates in the merit list above me..i belong to sc category and also eligible for cpp quota ..any chance for selection? thank u sir..one more question ..cpp quota is eligible for only local candidates to A.P. 2% VACANCIES ARE RESERVED FOR THIS..does it mean that all 13 districts candidates of cpp are eligible? im 4 th female sc candidate in merit list sir..
yes, all 13 districts CPP quota Candidates are eligible. 33% for women so only 5 vacancies for females right?? 2% means 2 vacancies right sir? sir im 4 th among sc female candidates in merit list..nd in ASI im 3 rd sc female candidate. Sir when will 2018 notification will be announced for Asi finger breau post? Can any one post the Exam paper of AP Finger Print Bureau (Computer).Please it might helpful to some other.